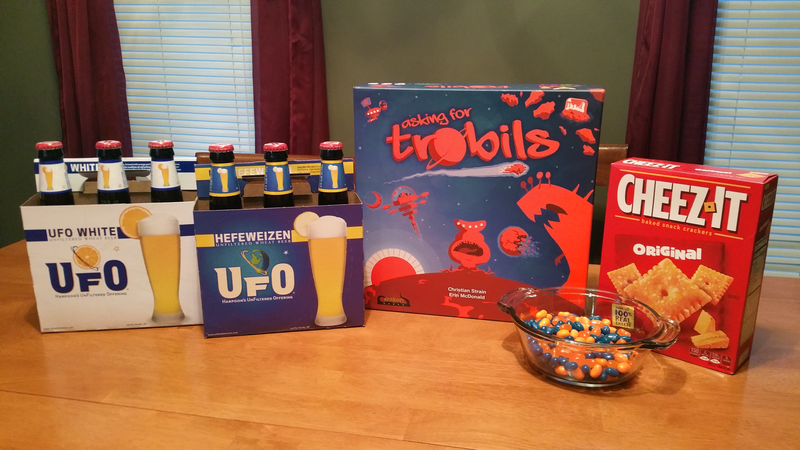 There’s probably some intergalactic law about operating spacecraft under the influence, but we like to live dangerously, so for this week’s Game & Beer Pairing we threw caution to the wind and some Trobils into the sun! The player boards and resources are outstanding. Also they’re orange. 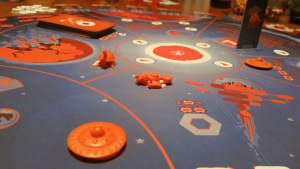 Asking for Trobils is a worker placement sci-fi game that, while highly strategic, doesn’t take itself too seriously; the purpose of the game is to rid your galaxy of a pesky race called Trobils by collecting them and throwing them into a sun. It also happens to be one of our favorite games. 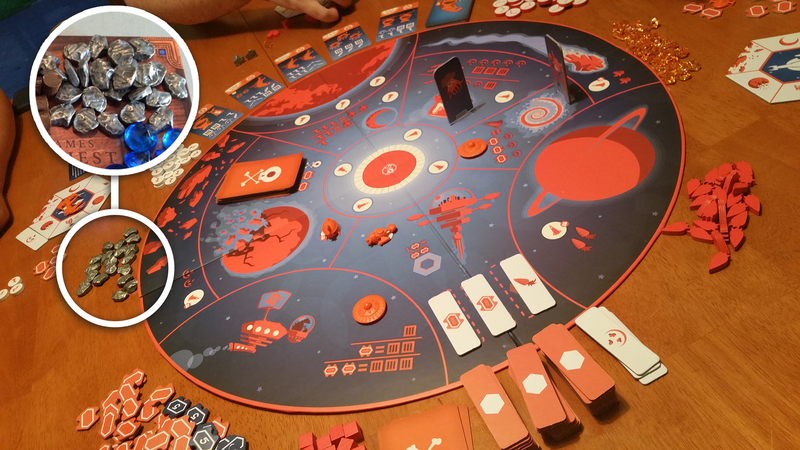 The creators, Kraken Games, have injected it with a healthy dose of humor and an interesting design choice—most of the board and components revolve around the colors orange and blue (originally it was just orange!). Much of the art, cards and even spacecraft minis parody familiar science fiction franchises, which also adds a fun little element to the game (especially the tiny plastic Futurama ships—we nearly come to blows over those each time we play). And by some galactic happenstance, our trip to the local beer outlet netted us not just one, but two space beers—and even managed to match the color scheme pretty well, choosing UFO White and UFO Hefeweizen from Harpoon Brewery of Boston. And because we’re theme-junkies, Eric scored us a custom assortment of orange & blue jelly beans and our favorite orange crackers to snack on. 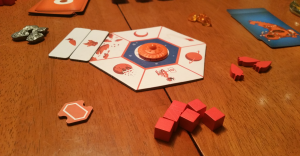 Take a look at those beautiful, orange ships! 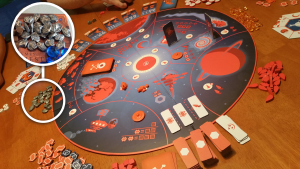 Asking for Trobils is a big hit with our game group; it’s strategic, the turn structure is well-paced, and as with many worker-placement games, there’s very little player interaction, which generally reduces the air of anxiety and profanity that comes with a more aggressive play. Speaking of our beer, it’s difficult to say an unkind word of just about any beer that’s brewed in Boston; that city just knows their stuff. 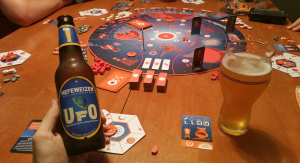 Harpoon is no exception: the UFO White, as an American white ale, is a bit sweeter than, say, a Belgian white like Hoegaarden, but the coriander and orange is milder, giving way to more of the witbier taste. Even great games must come to an end. And because we love segues… Speaking of throwing aliens into a star, we had our fair share of that. 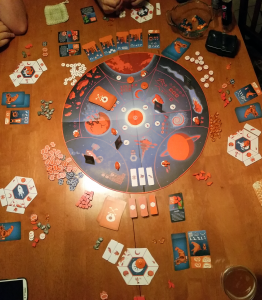 Eric started the chain reaction by dunking the first Trobil, followed by each other player in turn grabbing hefty bounties for their actions. In the end, Eric snatched up a Trobil or two just ahead of the competition and won by a trio of space carrots. We highly recommend this pairing to anyone looking to enjoy a lighthearted afternoon game while drinking a light-bodied, flavorful beer. Don’t mistake our meaning though—we had our fair share of giggles at the concubine-esque Riffraff cards, alien resources that (usually) help you out, that were very clearly (according to us) space hookers. There you have it. Space hookers and beer. What are your favorite hefe and wit beers? What other games have you played that heavily favor one color? Awesome review guys. “Space-hookers” lol. Thank you for creating such an imaginative and uniquely designed game. It truly is one of our favs.